For Sagan’s first Halloween, Ryan and I wanted to pick something delightfully geeky. Star Trek was too obvious and “Tetris Piece” looked like it would be uncomfortable for Sagan to wear… or more importantly, uncomfortable for Mommy to put on Sagan. Every time I have to put something on over his head, I remind him about the birth canal but he seems to find little solace in precedence. Ryan suggested “Gir” from Invader Zim. 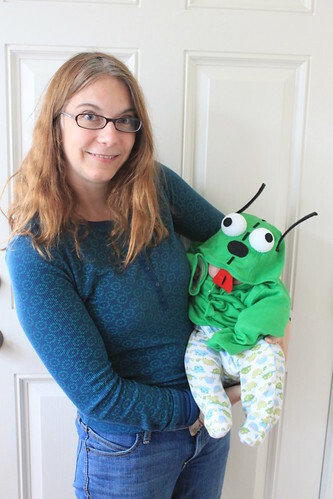 Sagan’s Aunt Carolyn is a big Gir fan and even has a handmade Gir hat! I have friends in Washington State who named their dog after Gir. Ryan’s suggestion seemed like it would be an instant score in a niche audience! So how does one with limited time make a costume for a 16 week old baby? Well, to help answer that question I needed to look no further than Kitty’s Heart of Nature. Last year for her daughter’s first Halloween, Kitty made adorable owl costumes, using brown hoodies as the base. I ordered a reversible green jacket (with hood!) from Precious Cargo. Take your handy glue gun, a supply of felt and two foam balls and voila– Gir costume. And like the “real Gir”, Sagan could be completely in disguise or reveal his inner self. Even though I copied Kitty’s hoodie technique, I was still feeling pretty creative and unique. That is, until I did a search on “Gir Hoodie”. It turns out, there are quite a few Gir Halloween costumes out there. As I scanned the photos in Google and Flickr, I realized I had taken part in a demonstration of convergent evolution. Convergent evolution is when unrelated species independently acquire the same biological trait. A good example is wings. Mammals, birds and insects all “invented” the wing and guess what, they were reinventing something the reptiles had done way back in the day of the pterodactyls! Really when you boil it down, convergent evolution is about problem solving. An organism is presented with a challenge in its environment and it comes up with a solution. Sometimes the solution is such a perfect fit to the problem, it is just asking to be discovered again…and again…and again. Such is the case with the Gir Halloween Costume. You have a green character whose head can peel back and reveal his robot self. 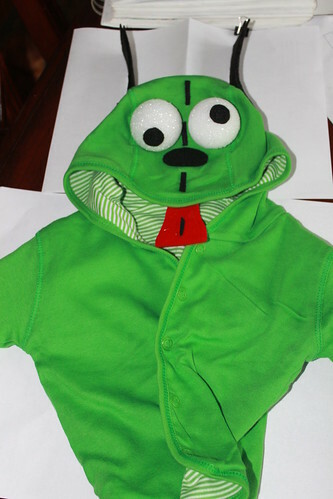 Uh… green hooded article of clothing. Duh!!! Sagan’s costume does have one thing going for it. 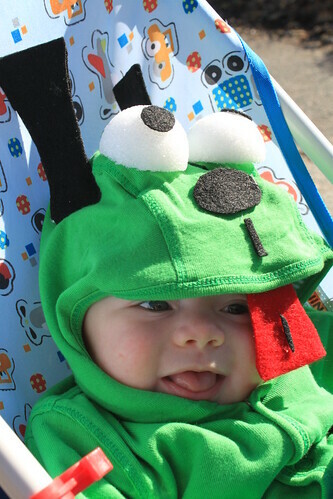 I didn’t find any other babies dressed up as Gir. There are more pictures of Sagan in his Gir costume on Flickr and there are plenty of pictures of other Gir costumes all over the internet. P.S. If you are interested in purchasing a Gir costume for yourself, SpookyKittenCoutures (pictured above) does do custom orders. You can also find a whole slew of Gir-themed products at HotTopic. On September 19th, my mother was armed with a refrigerator full of breast milk and Ryan and I went on a date! We drove up to American University to observe the “International Day of Peace” by listening to Dr. Jane Goodall speak. Dr. Goodall is famous for her work with chimpanzees, but she also serves as an U.N. Peace Ambassador. Early in her talk, she established how interest in chimpanzees translates to an interest in world peace. She described the harsh living conditions of the humans near the chimps. 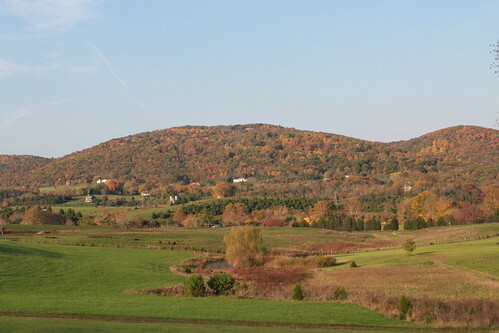 Most of the trees were gone and the land was infertile. The people were living in terrible poverty and cutting down the very last trees to survive. “While they were in that situation, how could you even try to save the chimps?” she asked. To help the chimpanzees, we needed to help the trees. 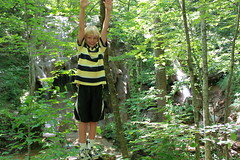 To help the trees, we needed to help the humans and improve their living conditions. The focus on people has helped. Goodall reported where there was barren land seven years ago, now stands thirty foot trees! 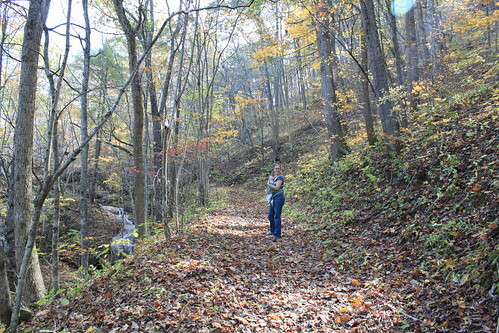 Her words and anecdotes remind us how interconnected all the members of an ecosystem are. Our memories are interconnected as well. As Goodall spoke, my mind drew some relations of its own. 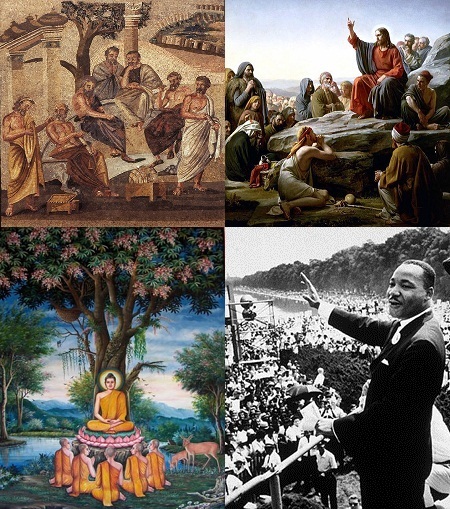 Jane Goodall, Plato, Jesus, Buddha, and Martin Luther King Jr.
That particular afternoon, we had stunning autumn weather and this event took full advantage. It was held outside in the amphitheatre. As we waited for our speaker to hit the stage, I looked around at the formidable audience, inhaled fresh air and felt a strong connection to the students of the past three centuries. Plato taught in a garden near Athens. The famous Sermon on the Mount took place outside. Buddha taught “the five” under a tree in Deer Park. In contemporary times, inspirational game changers such as Martin Luther King Jr. taught their philosophies outside. A number of great teachers, it seems, teach outside. Here I was, outside and eager to learn, just as many students throughout history had done before me and 50% of the world’s students continue to do today. Another topic Goodall discussed was how to communicate your points and opinions, particularly to those who are resistant to your ideas. “Never adopt the attitude of ‘I’m right’ and ‘You’re wrong’ because they stop listening.” Instead she recommended to tell stories. Although the stories Goodall was referring to are far from the stories one would find between the covers of Cat’s Cradle or Slaughterhouse-Five, I was reminded of a passage by Kurt Vonnegut, Jr. In Wampeters, Foma & Granfalloons, he wrote about the power of Fiction over New Journalism, declaring fiction to be “a much more truthful way of telling the truth.” He believed “the New Journalist isn’t free to tell nearly as much as a fiction writer, to *show* as much. There are many places he can’t take his reader, whereas the fiction writer can take the reader anywhere, including the planet Jupiter” to make his point. On October 23rd, Ryan and I attended “Reinventing Radio: An Evening with Ira Glass” where the This American Life host spent a good ninety minutes on the power of narrative story telling over traditional journalism. During his first three years of “This American Life” Glass thought that he was an innovator and had developed the perfect formula for telling a story. When he went home for the High Holidays, however, he attended a sermon and noticed the same pattern. It was then he realized his technique of story telling was far from new. “I invented something that was old when Jesus did it!” he lamented. But it may be that thousands of years of experience that gives storytelling its power. Glass spoke on a story’s ability to invoke empathy and to help even political adversaries to see each other in a different light. “There is something in how we are built as people to interact with a story.” he said. The best way to the heart, indeed. Of all the possible accomplishments in this world, I would expect “President of the United States of America” to be one of the more noteworthy endeavors to include on one’s tombstone. That inscription, however, is missing from the grave of our nation’s third President. 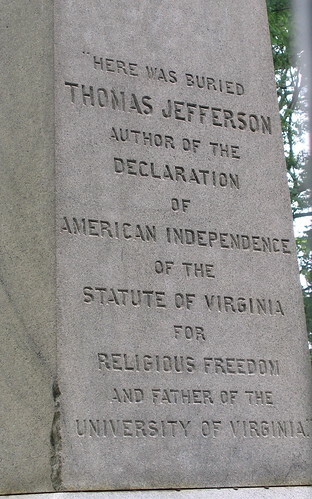 Thomas Jefferson picked three accomplishments he wanted to preserve. The last item on the list was “Father of the University of Virginia”. Jefferson took more pride in UVA than he did of being President. The Louisiana Purchase was under his tenure, doubling our nation’s size! But that paled in comparison to establishing the nation’s first nonsectarian university and educating the minds of the future. During the Question and Answer session, Jane Goodall was asked, “What’s the best thing you’ve done?” Her answer was “giving young people opportunity to understand you can make a difference every single day” through her organization “Roots and Shoots“. Roots and Shoots focuses on involving youth in service projects around the world. 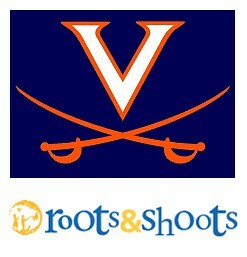 Right now, there are Roots and Shoots programs in 126 countries and counting! Like Jefferson, she didn’t choose one of the more obvious accomplishments. Like Jefferson, her heart was with her impact on young minds. Celebrating the UN’s “International Day of Peace” with Dr. Jane Goodall by ideonexus. The author’s family did a Maple Syrup Tasting! MAPLE SYRUP! A number of years ago, I attended the All Things Olive Festival at Villa Appalachia. There, I got to participate in a series of four tastings – wines, olive oils, olives and a balsamic vinegars. As delicious as those items were, I have a feeling I would fancy a “Maple Syrup Tasting” most of all. What a neat idea to accompany autumn! 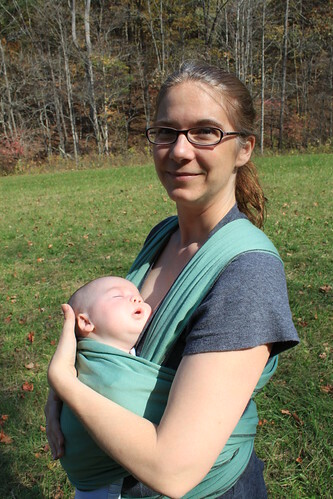 Check out Mindful Momma’s full A Maple Syrup Tasting post to read about the syrups they tasted and their findings. 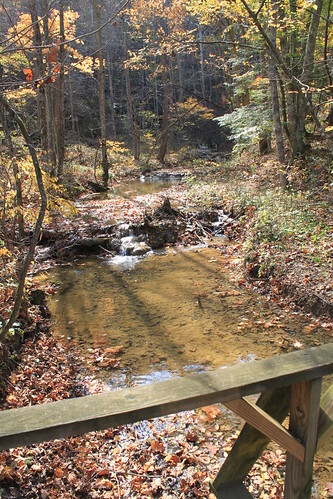 Blacksburg, Virginia Pawpaw Enthusiasts – When we were at Falls Ridge with Sagan, we saw some pawpaws by the creek above the falls. 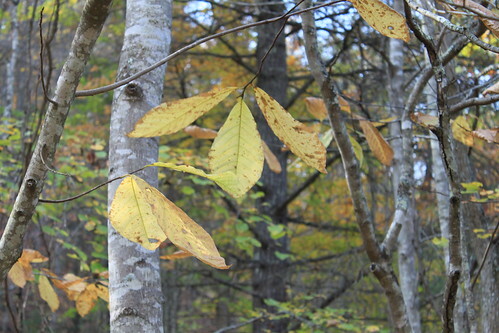 If you yearn to see a pawpaw fruiting in the wild, that may be a spot worth your attention next fall. Please note- you’ll want to research The Nature Conservancy’s rules regarding eating them. 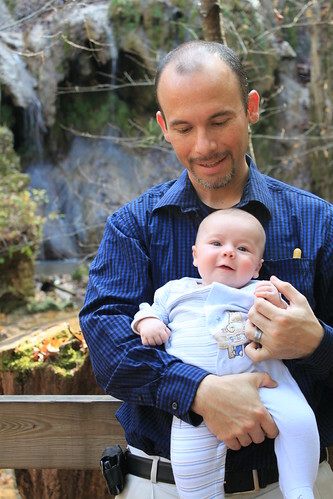 This week, Ryan and I had a business meeting in beautiful, gorgeous, splendidly stunning Southwest Virginia. Our boss could not have scheduled a better time! 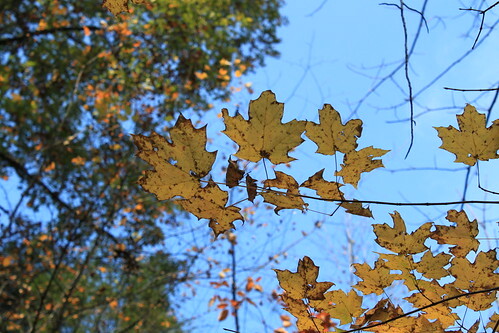 We were visiting right in the midst of the changing autumn leaves. 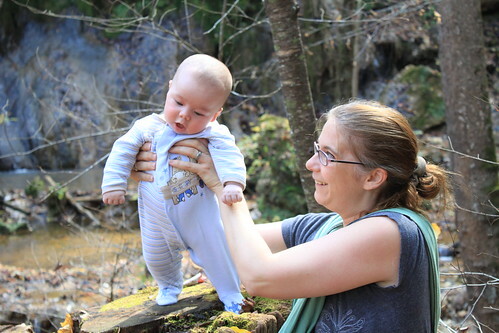 Although the primary purpose of the trip was business, we had to sneak in a hike with Sagan as well. 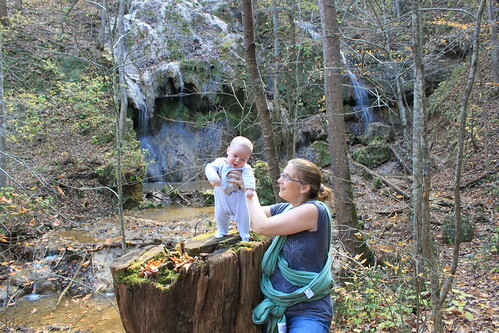 One afternoon when Sagan was awake, we drove over to the Nature Conservancy’s Falls Ridge Preserve. 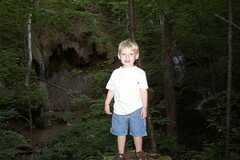 When I lived in Blacksburg, I used to take my friend’s son, Penn, out hiking. 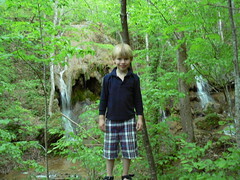 Over the years, I managed to get a picture of my young hiking buddy in the same spot at Falls Ridge at two years old, five years old and nine years old. This week, the tradition started again. Ryan and I got a picture of Sagan at the same spot. He needed a little help posing. Speaking of baths…. I noticed the photos of Sagan getting a bath demonstrate the growth he has been up to! I noticed NOFX is going to be playing in Norfolk, Virginia this weekend. I won’t be making the show, but that doesn’t mean motherhood keeps me from thinking of my favorite band. In fact, I think about them at least twice a week! 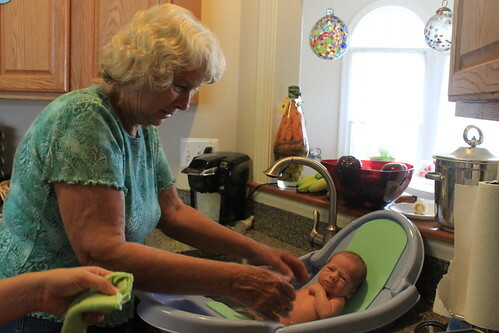 Our pediatrician recommended that Sagan get a bath two days a week. I picked “Wednesdays” and “Saturdays”. 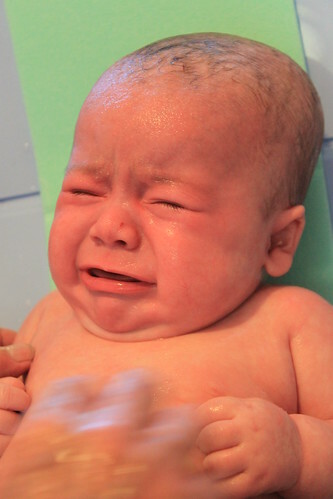 Sagan is still not a fan of baths, so I have a nice side perk from our selected days… every time Mom and I are preparing the bath I get to belt out a modified chorus of NOFX’s “Shower Days”. platinum elevatorstu… on Injured Henry.